A combination of many parts now comes complete and ready to install in minutes, versus hours with other types of installations. 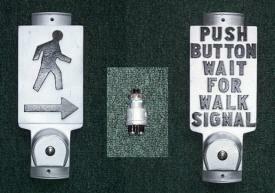 Feature One- The weatherproof Pedestrian Pushbutton has heavy silver contacts rated at 35 amps at 12 volts. It has been designed for marine, fire apparatus, and industial use. The most rugged Button used in the installation to date, is threaded into the cup assembly from the rear. The Button is mounted with a 3 degree angle, which produces natural water run off, therefore reducing frozen, or stuck buttons in colder climates. Feature Two- The Legend is cast into the face of the Plaque, eliminating the cost of an additional sign and the labor and materials to attach a separate sign on the plaque. If the raised Legend is defaced, it can be restored simply by using a sponge brush or roller. 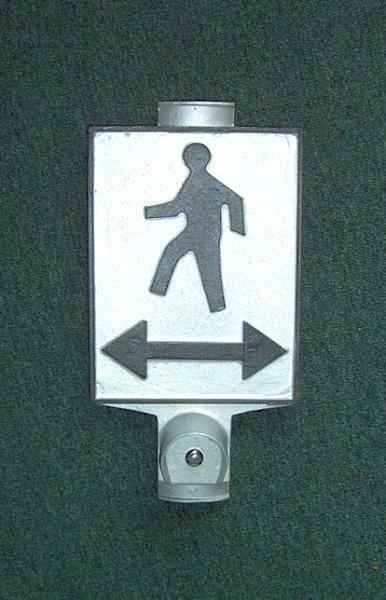 There is no need to be concerned about a passing citized injuring themselves or their clothing on jagged metal, or splintering wooden pedestrian signs. Feature Three- The Banding Brackets can be used if you do not want to drill and tap the mounting surface.This eliminates the need for any electrically run tools or power source during installation in the field. Installation is quick and be done simply in minutes, again saving labor costs. Feature Four- The standard plaque is cast aliminum. Color combinations are optional at no additional cost. This Combination Plaque finally makes an installation that will be simple at a surprisingly low cost. We realize that every State, City and Town has unique problems of their own due to weather conditions, vandalism, size and type of poles, etc., therefore, modifications can be made to suit your needs. Legend changes can be made at no additional cost. Please do not hesitate to ask about any additional changes you may require.